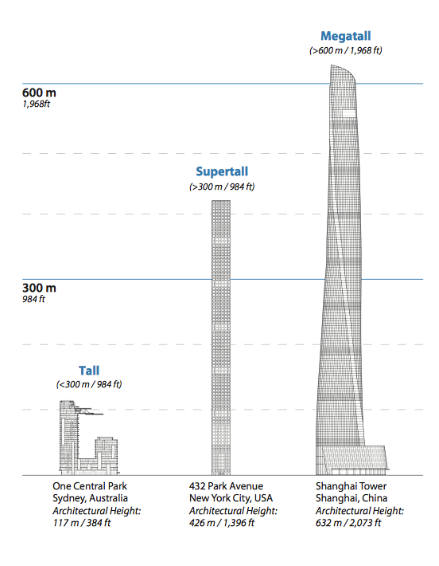 Will New York City Ever Build A “Megatall Skyscraper"
Surely if these are the only two reasons for building height restrictions in NYC they can be overcome? Before diving into zoning regulations we must first understand what they are exactly and why these laws inhibit megatall skyscrapers. Furthermore private developers aren't impelled to construct megatall buildings to add to the city's prestige, but sensibly take into account their financial limitations. The power of air rights has been a major contributing factor to a cities advancements throughout modern day history. One of the main fears every new yorker faces when buying an apartment with picturesque views is the day a developer comes along and plants a building directly in front, essentially ‘stealing’ those views and drastically reducing the worth of their home. This is where air rights come into play. Every land lot in Manhattan has a maximum density restriction and any unused air rights can be sold to neighbouring lots, known as “Transferable Development Rights” (TDR) under certain conditions such as lot size and setbacks, in order for the neighbouring building to be built taller than the height limitations. According to the Department of City Planning an airlot is $225 per square foot, an increase of 47% within the past year. 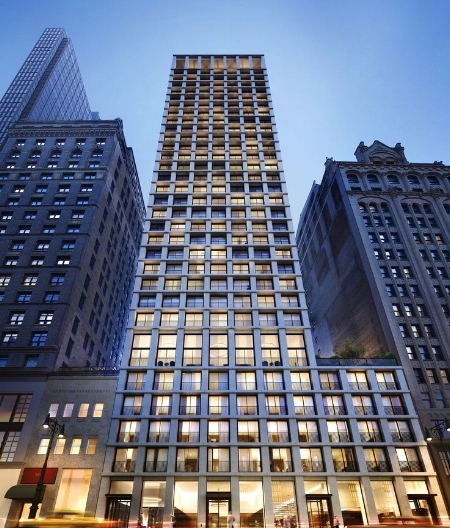 Developers are now paying as much for air rights per square foot as they are for land size per square foot. This however in turn allows for higher buildings and a greater return on investment. Typically the taller you construct a building, the greater the land size needed. This drastically increases the price of a building especially in a city such as Manhattan where prices come in at $1773 per square foot. If we were to study how such heights are achieved based on land size a perfect example would be the Burj Khalifa, currently ranked as the world's tallest building. The width of the base is roughly 525 feet. To achieve such width in Manhattan would be next to impossible given the lack of space. If a developer were build at such heights the financial costs of required ground coverage would be so astronomically high it would increase the overall cost of the building to the point that a financial return would be next to impossible, given the price you would have to sell per square foot to break profit. 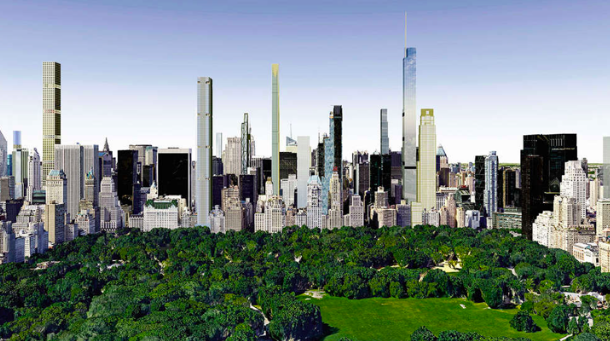 Until engineers come up with a way to build taller buildings with minimal ground coverage achieving such heights is deemed as unprecedented within Manhattan. As previously mentioned the lack of primitive space in a developed city such as Manhattan is minimal. Furthermore when diving deeper into reasons for building height restrictions we found that New York City is split into different zonings within each neighbourhood which fall under different floor area ratios. Floor area ratio is the ratio of a buildings total occupied piece of land subject to its height. A successful floor area ratio is one that achieves the highest density possible while obtaining the most miniscule amount of land. This is posed as a challenge when building megatall skyscrapers. The taller you build, for stability, the wider the ground coverage required, hence overcoming the challenge of floor area ratio is essential if NYC is to build taller and greater buildings. Apart from finance being the largest factor contributing to New York City's lack of megatall skyscrapers, air rights, land size and floor area ratio are three demands the city has to adapt. Additionally, with megatall skyscrapers being a new concept within major cities we must accommodate to and or invent newer building techniques, operating systems, schedules, etc. if these buildings were to be as successful as current skyscrapers. How Long Does It Take To Get A Construction Permit? In most communities across the United States, you have to obtain some form of construction permit for almost every building, remodeling or restoration project you want to undertake. For many developers, the permit process is a necessary evil: We know the rules are in place to ensure safety and adherence to proper codes, etc., but when our applications get lost in the bureaucratic abyss, we feel like pulling out hair out as our construction teams stand by, waiting for final approval. Time is money, and sometimes it feels like we’re just wasting gobs of both. In short, when you work with Wellbuilt, we can’t tell you precisely how long it will take to get a construction permit, but let’s talk about the permitting process in the areas in which we build—just so you can get a (slightly) better idea of what to expect. As a city in which construction literally never stops, New York City requires permits for almost everything—and while developers love to build here because of the investment prospects, the waiting game for getting one or more permits can be incredibly frustrating at times. Here in NYC, the time frame for obtaining a permit depends mainly on the type of work being done and how many departments must review it. For simple renovations like electrical work, you might get your permit in as little as a week. For larger building projects, you could be waiting up to 6 months for your permits to go through—in some cases even longer. Patience is definitely a virtue here. While neither Massachusetts nor Connecticut offers a specific time frame for obtaining permits, the rules in both states require officials to review building permit applications to approve or deny them within 30 days after being submitted—and many local towns can get them reviewed even sooner. Thus, generally speaking, the permit process goes a bit more smoothly in both of these states. That said, there are always issues that may hang up the process—for example, if you turn in an incomplete application, your approval may be delayed or denied. Also, if there is a problem with your application and it gets denied, you may have to correct the problem, resubmit and wait another 30 days for approval. No one really enjoys having to go through the permitting process, but if you try to bypass this process, you could face hefty fines, plus you may required to undo things you’ve done and redo them the right way to come into compliance—which costs even more money. As painful as the waiting game may be, the rules are there for everyone’s safety—and even though time is money, you’ll save more money in the long run by making sure you’re in compliance. For the second time in three months, a fire in Trump Tower has made national headlines, sparking a fresh debate as to whether current regulations for automatic sprinklers in NYC residential buildings are extensive enough. On Saturday, April 7, a fire in a residential apartment on the 50th floor left its owner dead and six firefighters injured before the fire was extinguished, according to CNN. Authorities made a point of mentioning that the residences in the tower are not equipped with automatic sprinkler systems, which caused the fire to spread more quickly. Why Were There No Sprinklers? 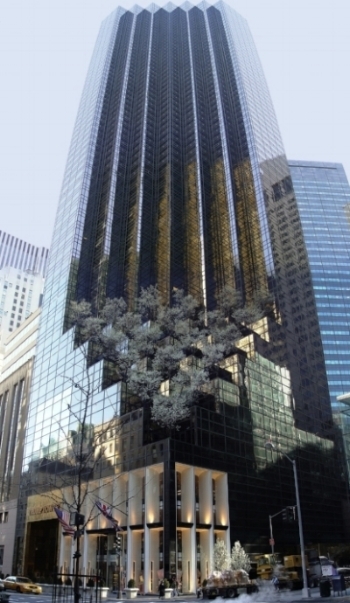 At the time Trump Tower was completed in 1983, automatic sprinkler systems were not required in residential buildings in NYC, or at least in the residential sections. In 1999, then-Mayor Rudy Giuliani signed legislation requiring new residential structures to be outfitted with sprinkler systems. At the time, fire safety advocates also lobbied that the law require older residential buildings to be retrofitted with sprinklers; however, Trump and others lobbied against the measure, saying it was too expensive. In the end, Giuliani signed a bill that grandfathered Trump Tower and similar buildings in a category that exempted them from complying with new sprinkler regulations. This week, as CBS New York reports, the head of the City Council Housing and Buildings Committee is planning to announce a new push for legislation requiring all NYC high-rises to be retrofitted with automatic sprinkler systems—including Trump Tower. In the aftermath of the 9/11 tragedy, commercial and office buildings are already subject to retrofitting regulations, as covered in Local Law 26. If it goes through, the proposed new legislation would close this gap for residential structures. If you’re a developer currently building a multi-story structure in NYC, you’re probably already aware of requirements to install sprinkler systems; that won’t change. If you are purchasing and/or remodeling an existing residential structure in the city, you should monitor this situation in the upcoming months as current laws may change. If you have any questions about installing automatic sprinkler systems in your building, give Wellbuilt a call at 1.866.846.4874. When planning any kind of multi-story construction, especially here in the northeastern United States, deciding how you will heat the building is one of the most far-reaching decisions you will make. Not only may you be limited to certain options based on where the building is built, but the utility structure can have a huge effect on your construction costs as well as ongoing expenses for the building itself. In many parts of the country, developers are limited to two basic choices for heating: electric and natural gas. Here in the northeast, especially in older larger cities like New York and Boston, additional options are available. Let’s look at some of these options and discuss pros and cons. Electric heating is one of the easier and more versatile options, in part because it’s readily available in most places and in part because you can include air conditioning and heating in the same basic system if you like. The down side is usually cost. The cost of electricity in New York is nearly the highest in the nation, for example, so many builders in this area find electric heating to be very cost-prohibitive. Heating oil is more common in the northeast than in other parts of the country, and therefore it may be an option at some building sites. 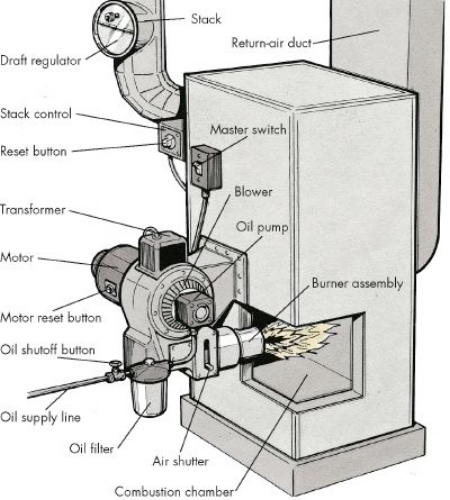 The advantages of oil heat are that the oil is generally not as volatile as gas, is dense and burns hot—meaning less of it can be used to heat more efficiently, keeping costs lower. The biggest downside (besides being a higher-polluting energy source) is that fuel oil is being phased out. It’s available in fewer and fewer areas (only 1 percent of buildings in NYC use it), there are fewer suppliers for the oil itself, and if you install heating/fuel oil as your heat source, you’ll probably have to change it out eventually for something else. Steam heat is another common option in the northeast, and many NYC high-rises use it because steam rises naturally, making it more cost-effective as a heat source than most other options. Steam can also power air conditioning if you install an absorption chiller, and steam can reduce the need for humidifiers. The primary disadvantage to steam heat is that it’s not available at all sites. By process of elimination, natural gas is rapidly becoming the default heating option for high-rise buildings. It’s more common and accessible than steam or oil and nearly as available as electricity—just not nearly as expensive. It also burns cleaner than other energy options. The main disadvantage might be higher construction costs. 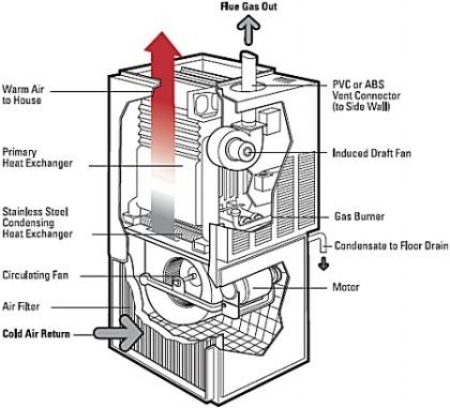 Which heating system is right for your high-rise construction project? The answer may depend on which utilities are available at your site, your budget and a cost analysis. Wellbuilt can work with you to help you decide what is right for you. To learn more, give us a call at 1.866.846.4874. In a day when environmental awareness is more necessary than ever before, developers and builders have plenty of reasons to seek LEED certification for their construction projects. Firstly, many cities offer financial incentives to building projects who implement “green” protocols and lower their carbon footprint. (New York and Boston both have these initiatives in place.) Secondly, LEED certification has become something of a badge of honor that impresses and attracts residents, tenants and companies to occupy the space. And thirdly—all other reasons aside, protecting the environment is just the right thing to do, in whatever ways we find to do so. If you’re thinking about pursuing LEED certification for your upcoming construction project, here’s what you need to know to get started down the path. The higher the point rating, the better rated your building is for energy efficiency and sustainability, and the more credibility your building has as a “green” construction. Register the project with LEED (accompanied by the appropriate fee). Form a plan of action. Certification is accomplished by meeting established prerequisites and earning a certain number of points toward certification. The general list of available credits can be found here. Apply for certification, based on achieving the objectives in your plan of action. The standards for LEED certification have differed based on the type of construction project (e.g., homes, commercial, existing structures, schools, retail, etc.). The newest protocol, LEED v4, offers a more flexible, streamlined approach that embraces a variety of projects while raising the standards for green building moving forward. Learn more about LEED v4 here. LEED’s entire approach to sustainability is not just about numbers; it’s about seeing a construction as an integrated entity, not unlike the human body with many working parts. Understanding this concept up front can help you make construction decisions that improve your chances for achieving LEED certification. This video explains a bit more. The USGBC has provided a set of guides to help various construction projects find the path toward LEED certification; this is a great place to start if you are serious about green construction and sustainability. 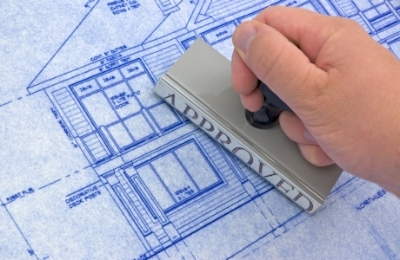 Wellbuilt can also advise you on the best ways to qualify for LEED certification with your building project. To learn more, give us a call at 1.866.846.4874. Can you imagine a day when you walk past a construction site and see a high-rise building going up…without any human laborers at the site? No, it’s not the latest sci-fi series on Netflix (although it could be—call us, Netflix); this is the real world, in the not-so-distant future. Last year, Balfour Beatty of London issued a prediction that thanks to the rapid growth of construction technology, we are likely to see human-free construction sites by 2050. However, just this month, ForConstructionPros.com upped that prediction to as early as 2025—less than ten years away! A decade ago, the idea of fully autonomous building construction by machines was definitely the stuff of The Jetsons—something we could envision only in a cartoon, “maybe someday” kind of sense. But now, technology is advancing at such a rapid rate that experts can now see a viable path toward humanless build sites, right alongside self-driving automobiles. Whether or not we see that particular benchmark come to pass, there’s no denying that technology is revolutionizing the way our industry works. 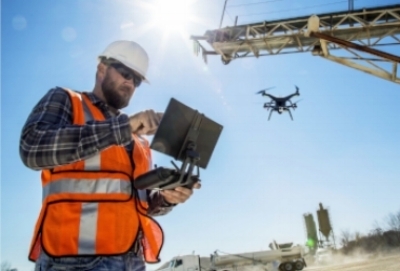 From the use of drones to 3D printing, from building information modeling (BIM) to augmented reality (AR), technology is enabling us to build high-quality structures with greater speed, greater accuracy and higher levels of safety than ever before. We may discuss specific advances in later posts, but for now let’s look at just a few ways modern construction tech is making our jobs easier. More business is being done on-site via tablets and smartphones than ever before, with teams being able to collaborate and coordinate instantaneously via Internet connectivity. Blueprint apps are rapidly replacing the large, cumbersome physical drawings we used to use. GPS technology enables us to survey sites with stunning levels of accuracy compared to older, conventional methods. Our location desks piled with paperwork are now being reduced to devices we can hold in our hands—and those devices in turn connect us with the rest of the world. Construction management software platforms now enable us to coordinate multiple teams on multiple projects from any location, with instantaneous communication and updates reducing the risk of error. From project management to accounting, technology helps us stay on the same page, on target, in compliance and in budget. Construction tech is also helping us make our job sites and our workers safer, from drone monitoring to halo lights to “smart headsets” and more. Responsive clothing can now monitor a worker’s body temperature and heat or cool them accordingly; safety gloves are being designed to resist punctures, saw blades and even hammer strikes! Will we one day see human-free construction sites? Only time will tell, although recent advances make the prospect more likely than ever—and if it does happen, we’ll have the inevitable discussion about what happens to our jobs. One thing is clear for now: Construction technology is speeding up, not slowing down, which means our industry will likely look much different in the next 10 years or so than it does today. If you’re a developer or investor thinking to embark on a large construction project, 2018 may be your year. All indicators point to a boom for the construction industry in 2018, according to a recent report by CNBC. With an ample and eager labor force, plentiful materials, reasonable costs and overall optimism, this may be the best window of opportunity developers have seen in years. What is causing experts to predict such a bounteous year for construction? Let’s take a look at a few of the indicators. · A significant spike in hiring. The Bureau of Labor Statistics indicates that hiring within the construction sector increased by 35 percent between 2016 and 2017, amounting to at least 210,000 new jobs. Thirty thousand of those new hires occurred in December alone, this despite a disappointing jobs report overall for the month—and the demand for labor shows no signs of slowing. When construction companies hire at these rates, it suggests an increased demand for new construction. · Construction spending is at record highs. The amount of money spent on construction has been increasing every month for the past several months. Recent reports from the Commerce Department place November spending estimates at nearly $1.26 trillion, an all-time high. · Increased optimism in the industry. 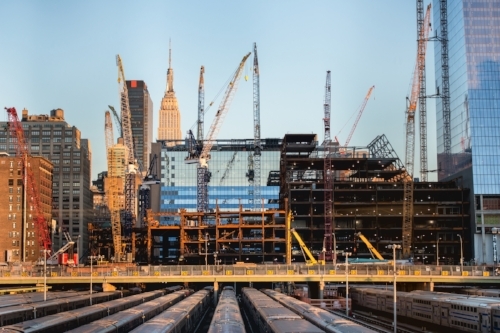 Between the lessening regulatory restrictions, business-friendly tax overhauls and a growing economy, optimism within the construction sector is quite high—and equally so among developers who hope this less restrictive climate will result in modest pricing, abundant resources and ultimately higher profits. Looking deeper at the numbers, while construction overall is expected to increase this year, the biggest gains are expected to fall to the commercial and office sectors, which have not grown significantly in the past few years. Residential developments and multi-family units, which have benefit from increased lending over the past several years, may see a leveling off on their growth rates as interests shift more toward the commercial side. One contributing factor may be the tax code overhaul, which is significantly favorable to businesses and may lead to increased demand for commercial space. Developers and investors who want to make the most of a construction boom are wise to get in on the opportunity sooner, rather than later. The reasons are simple: 1) Labor, materials and financing are likely to be more abundant in the beginning; and 2) You have the benefit of modest costs before increased demand drives prices upward. If you own or plan to own an office building in New York City that is 100 feet or higher, this year you’re probably going to hear a lot of talk about Local Law 26 of 2004 (LL26, for short). 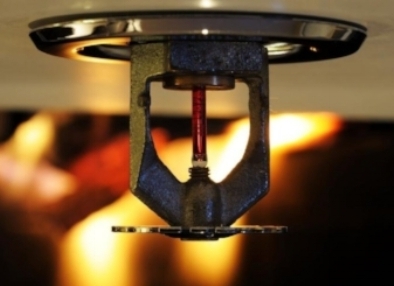 This law, strengthens fire safety requirements for existing office structures throughout NYC—most notably the requirement to install a sprinkler system within 15 years of the law’s enactment (specifically, by July 1, 2019). Here’s what you need to know to make sure your building is in compliance as this deadline approaches. Between its dense population and multitude of high-rise structures old and new, it comes as no surprise that New York City fire codes are among the strictest in the country. While most new structures comply with these codes as they are built, many older buildings do not. LL26 was enacted in response to lessons learned after the 9/11 attacks, when the NYC government determined that current fire codes didn’t provide enough protection for business occupants in existing structures. The new law stipulated a laundry list of retroactive changes and requirements for these buildings, ranging from exit signage and egress to stipulations for scissor stairs, elevator vestibules and so on. (You can see a summary of the provisions here.) Most of these requirements have already been met per early deadlines set in 2006-2007. The one requirement still outstanding—and the one causing possibly the most expense—is the installation of sprinkler systems in these buildings. We are coming up on this final deadline next year. Although the deadline for LL26 sprinkler installations isn’t until mid-2019, buildings that haven’t already made these upgrades are required to file an interim report by July 1 of this year indicating progress on the sprinkler upgrades and a plan of action. Thus, property owners whose buildings are not yet in compliance with the law must start formulating a plan and file a report with the city within a few months. How Do I Know if My Building Is Affected? · A compliant sprinkler system is not already installed. 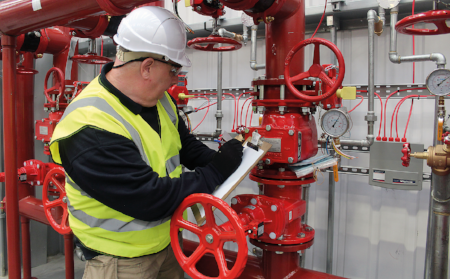 If your building does have a sprinkler system, you should also have it inspected to be sure it meets the specific requirements of LL26. Yes. If your office building is designated as a historic landmark and installation of a sprinkler system would alter the building drastically, you may be able to obtain a waiver exempting the building from LL26 requirements. The same holds true if your building is not a landmark but installation of a sprinkler system would be impractical due to structural limitations. If you have questions about whether your new or existing building needs work to comply with New York City fire codes, we’re here to help! Call Wellbuilt today at 1.917.475.1207. In the previous post, we began talking about Volatile Organic Compounds (VOCs) that are common in paint and other household products, and the inherent dangers of these chemicals. We also mentioned that many manufacturers are now developing non-VOC paints to reduce our exposure to these compounds. But are non-VOC paints right for every project and/or every budget? Let’s take a deeper dive and discuss it further. Obviously, the greatest advantage of a non-VOC paint is that you, your family and/or your tenants aren’t being exposed to harmful chemicals—or at least being exposed to far fewer of them. However, that’s not the only factor to take into account. Let’s look at a few other pros and cons of non-VOC paint. · Improved air quality, both immediately and in the long run. You can be comfortable knowing you’re not breathing in harmful pollutants from the paint. · Better for the environment. Non-VOC paints are frequently touted as a “greener” solution to their counterparts, and they are popular among those looking to have a reduced carbon footprint. · Quicker drying. Non-VOC paints are generally water-based rather than oil-based, meaning they dry more quickly, causing less of a disruption in schedules. This can be advantageous if you’re simply repainting an existing room, less so in new construction situations. · More expensive. Non-VOC paints can be up to twice as expensive as the alternative as they cost more to make. This trend is gradually moving downward, but still you can expect to pay more. · Quicker drying. You’ll notice we listed this as a “pro” just a minute ago. That’s because quick-drying paint can be a blessing if you’re finishing a room in a hurry, but a curse if you’re a novice painter and the paint starts drying before you can finish. Non-VOCs may require some skill and different techniques to apply, and you might be better off hiring a professional to do the job. · Keep the area well-ventilated. · When painting an interior space, allow the odor to dissipate before using the room. · If doing the painting yourself, wear a mask and/or take breaks to get fresh air. For construction, development and remodeling projects of all types, we at Wellbuilt are skilled at applying non-VOC paints for our clients who request it. For more information, call us at 1.917.475.1207. Is anyone a fan of that “new paint smell?” (Reluctant hands go up all over the Internet.) It’s something we know we probably shouldn’t like—and granted, some people don’t—but for many of us, it’s a natural instinct to draw in a deep breath inside a freshly painted room. If so, congratulations—you have taken in a lungful of Volatile Organic Compounds, or VOCs. They’re not the best things for you, which is one reason why non-VOC paints are rapidly gaining popularity in the construction world. Volatile Organic Compounds are a variety of carbon-based chemical compounds that easily evaporate into the air—hence the odor. (Don’t let the word “organic” fool you into thinking these compounds are healthy. “Organic” simply means they contain carbon in this case.) 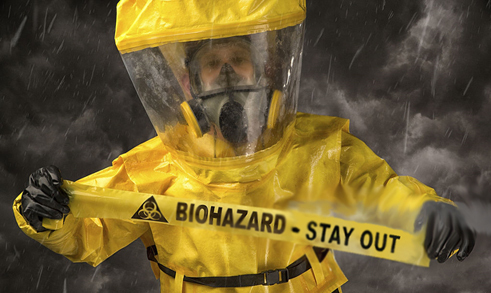 VOCs are generally toxic, and many are known to cause cancer. Trust us, you don’t want to breathe these vapors in for an extended length of time—especially not in concentrated amounts. VOC concentration in the house is strongest in the air when the paint is freshly applied and the paint is drying. However, VOCs can continue to seep into the air in your home for several years after painting. Different studies show that VOCs in the air is typically between 3 and 10 times higher indoors as they are outdoors. Also, paint isn’t the only household product containing VOCs. 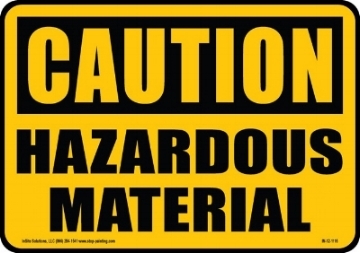 The New York Department of Health indicates these chemical compounds may be present in many different household products, from nail polish to hairspray, from paint thinner to mothballs, and even new carpet and upholstery. Are Low-VOC Paints Any Better? VOC levels have been reduced overall in our paint products over the past few years, and many manufacturers now promote their product lines as “low-VOC.” While this is certainly a good development, the problem is that there’s no real standard as to what qualifies as “low.” It’s the same concept as buying a “reduced-fat” food product. (Reduced by how much?) A low-VOC paint may contain slightly fewer harmful compounds than another type of paint, or it could have almost none. Furthermore, a white paint base could start off with no VOCs, but the tints added to make the color could be loaded with them. It’s difficult to tell what you’re actually getting. Should you be terrified? Does all of this mean you’re going to get cancer or have your brain cells fried? No, not necessarily—not unless you purposefully inhale concentrated levels of these vapors. (Read this article for more information on the dangerous practice of “huffing.”) Rather, VOCs, like other pollutants, is a fact of modern life; they are around us more than we’d like, and most people won’t get sick from them, but our lives would be better if we could reduce them. The environment would be better off, too. Non-VOC paints are healthier for us, but they aren’t necessarily the best choice for every painting or construction project. In the next post, we’ll talk more about the pros and cons of non-VOC paints, as well as how to practice safety when non-VOC isn’t an option. For more information on the best paint choices for your construction project, call Wellbuilt at 1.917.475.1207.